Why Recommend a Move Manager? There are three things I believe we can safely agree on. First, buying and selling a home is not easy. Second, clients tend to look to you as the solution for all their needs. Third, professional and trained extra hands to help are a beautiful thing. We are those extra hands. At Chaos to Calm we are trained and certified professionals focused on making relocations easier and smoother for clients. 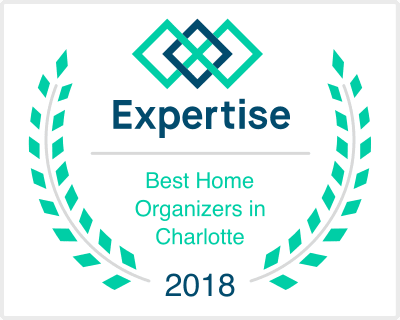 With services that range from decluttering and downsizing, packing, unpacking and complete resettling; we offer a single source of help for clients tackling the massive “To-Do” List moving creates. We are on hand to help your client emotionally, physically and logistically throughout the entire moving process. And the icing on the cake is that our service fees are paid by the client and not out of your commissions. Getting a home ready to put on the market can take clients weeks and even months. Often your clients are busy with their lives and just don’t have time. Sometimes the mere thought of tackling the pre-move prep may have them so overwhelmed they become paralyzed. We know what to do and how to get it done. Focused on getting the house ready to be listed efficiently and quickly, we have proven processes, trained staff, and the resources to get a house decluttered, cleaned up, cleaned out and staged in days. Faster to market equals faster to sell. 2) WE SPECIALIZE IN "STUFF"
I’m willing to bet your clients have stuff. Lots of stuff. Way more stuff than they need and certainly more stuff than you want in their house when you list it. Seeing as organized homes command higher prices, paring down and straightening up can directly impact the sale price of a home. Your CTC team will efficiently, yet compassionately, work with clients to cut back on the extras so homes are minimal. They are experienced in gently guiding clients through the process of deciding what to keep, donate, sell, gift and discard. As a bonus we deliver donations, facilitate consignments and will even pre-pack unneeded items to get them out of the way. Buyers want plenty of storage space. Cramped closets, creepy basements, junked up garages, and overflowing attics don’t help when you’re looking to show off a home’s storage capacity. Home and estate clean-outs are part of our wheelhouse so we have no fear when it comes to your client’s skeletons in the closet - at least the literal ones! By clearing out and organizing these areas storage spaces show as clean, spacious and plentiful. A beautiful thing for buyers who have a plethora of their own stuff! Research consistently shows that staged homes sell faster. Our designing divas know how to create a warm and inviting home that potential buyers can easily envision living in. From depersonalizing and decluttering to furniture and décor placement, they can create miracles. Because we facilitate the entire moving process, in addition to their own expertise, we come with a network of trusted service providers. Our collection of vetted professionals is on hand to help with everything from air conditioning to washing machine stabilization and all the nuts and bolts in between. So when your client realizes that they forgot to make arrangements for Yoshi the dog on moving day, no worries, we have a pet sitter on hand. Organizing, packing, and cleaning-out can be time consuming and for most seller’s it’s the ugly side of moving. Having professionals on hand to clear the client’s plate of these necessary evils frees them up to maintain a certain level of normalcy during the transition. It also allows them to focus on other important tasks, like getting you the paperwork you need! Move Managers are people that clients lean on. A large portion of our training and time is spent focusing on assisting clients with the emotional aspects of moving. As a steady, encouraging force throughout the move process, you can count on us to help keep your clients focused on the end result, moving forward and headed in the right direction.